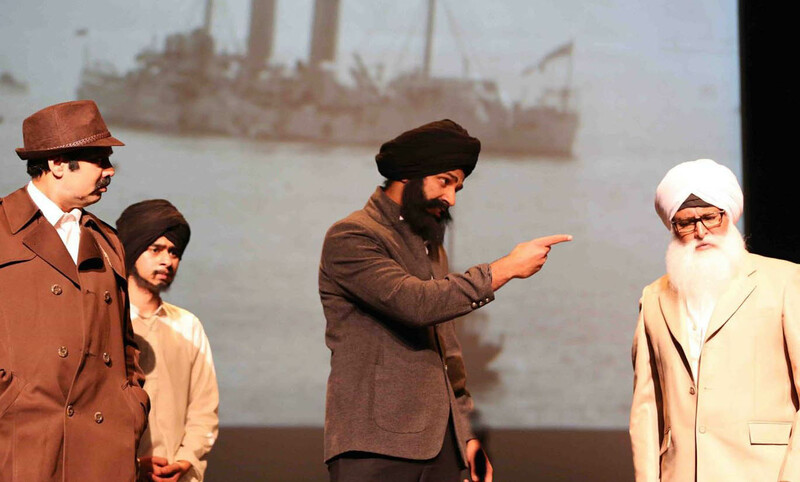 Play Komagata Maru staged in Calegary on October 4, in Central Public Liberary Theater Hall. Dr. Avnish Jolly, Winnipeg, Canada November 6, 2014 : One century after the Komagata Maru incident, the Punjabi community is actively paying homage to Martyrs in North America.During my child hood we went to see Komagata Maru exhibition from school when I was living in Chandigarh. At that time it was a holiday trip but now I feel how our community contributed for independence and we must recall the sacrifice of Martyrs. Due to this incidence Canada did not remove immigration restrictions for South Asians until the 1940s. During my college days many activities were organised in Chandigarh to mark 75th anniversary of Komagata Maru in 1989. We read in 1989, a number of organizations from BC’s South Asian Community commemorated the event by organizing various activities. The government had brought in a law ‘The Continuous Journey’ 1908 to stop the Indian immigration into Canada. According to this law, it was necessary to travel directly from one’s country to legally enter Canada. This was devised with the knowledge that there was no direct shipping service between India and Canada. To challenge this racist law Gurdit Singh chartered the Komagata Maru vessel from a Japanese shipping company. This ship arrived in Vancouver on May 23rd 1914 with 376 passengers on board. The government ignored its own laws and did not allow the passengers to disembark in Vancouver. The ship was forced out of the port of Vancouver on July 23rd 1914. It was in 1989, for the first time a loud voice was raised to highlite this issue of Canadian history. [youtube]https://www.youtube.com/watch?v=vcKZyzrMPrw[/youtube]In September, 2014 Azadi Abi aki Ha – One act play, choreography, on the occasion of 100 years of kamagata maaru were stage at 173 Talbot Ave Winnipeg. In the last week of October, 2014 after Dewali The Sikh Heritage Museum of Canada held its travelling Lions of the Sea exhibit at CHMR. It is one of six documentary films shown on a loop on a 96-foot wide and 16-foot tall digital screen. Volunteers of this organisation will continue to take the exhibit across Canada. Pradeep Singh Nagra, executive director of the Sikh Heritage Museum, which is taking the travelling exhibit across the country, advocated he’s pleased the ship’s story will be featured permanently at the Canadian Museum for Human Rights. Nagra shared the special exhibit will now move on to Montreal and Ottawa. Devinder Daman – a theater activist from Chandigarh is in North America these days Play ‘Komagata Maru – Safar Jari Ha.. (The Journey Continues) Written & Diected by Davinder Daman has already been successfully staged in Edmonton On Sept. 7, in Calgary on October 4, 2014. Now the theatre group (Progressive Arts Association of Alberta) is on the march to stage the play in three cities of Bay Area (California) in the month of December, 2014. Devinder Daman shared that this is his tribute to Martyrs and being a writer and director he initiated to build an environment, which gives the actors the encouragement to fly and literally takes the audiences through community participatory approach of theater on a journey, physically, emotionally and creatively.